Arnold of Brescia (c. 1090 – c.1155), also known as Arnaldus (Italian: Arnaldo da Brescia), was a monk from Italy who called on the Catholic church to renounce ownership of property, led the Commune of Rome's temporary overthrow of papal rule, and was later hanged by the Church for treason. 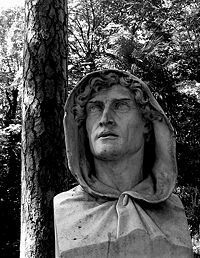 Born in Italy, Arnold became an Augustinian monk and then prior of a monastery in Brescia, possibly studying at some point with Peter Abelard in Paris. Witnessing the corrupting influence of wealth on the clergy, he became critical of the temporal powers of the Catholic Church, calling on his local bishop to renounce property ownership and return church lands to the city government. Arnold was condemned for this at the Second Lateran Council 1139. 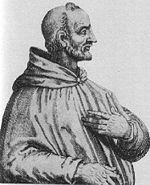 He soon stood trial with Abelard at Sens, where both men were sentenced to silence and exile as a result of the accusations of Saint Bernard of Clairvaux. Disregarding his sentence, Arnold continued to teach, but eventually came to Rome to seek reconciliation with Pope Eugene III. There, he found the city in turmoil and joined the cause of the Commune of Rome. His leadership was crucial in forcing Eugene to leave the city and restoring Roman democracy for several years. Although his political cause ultimately failed, Arnold's teachings on apostolic poverty continued to be influential after his death among the Waldensians and the Spiritual Franciscans. Catholic tradition condemns him as a rebel and sometimes as a heretic, but Protestants rank him among the precursors of the Reformation. Born at Brescia, toward the end of the eleventh century, Arnold aspired to a perfect life from his youth. Before reaching adulthood, he entered a monastery in his native city, where he was ordained a priest and later appointed prior of his community. Arnold reportedly completed his studies at some point under the direction of Peter Abelard. If the report is accurate, he must have gone to Paris around 1115. Whether or not he actually studied with Abelard, it seems clear that Arnold was influenced by his ideas. Even his detractors admit that Arnold was qualified for the high office of provost/prior at Brescia by his detachment from earthly things, his love of religious discipline, and the clearness of his intellect. Arnold also possessed an originality and charm of expression that he brought to the service of a lofty ideal. Brescia yielded to his influence, and in the course of several years Arnold advanced to be the unrivaled head of the reform movement then stirring the city. Brescia, like most other Lombard cities, was beginning to exercise its municipal rights. The government was in the hands of two consuls elected annually. Checking their authority was the local bishop, who was also a principal landowner. Inevitable conflicts arose between the rival forces, involving not only political and economic issues, but also religious passions. These conditions grieved Arnold. He pointed out the evils which afflicted both the city and the Church, concluding that the chief causes of these sins were the corrupting wealth of the clergy and the temporal power of the bishop. He hoped for the Church to return to a more purely spiritual tradition, which would also give it the moral power it lacked as a major landowner with powerful political interests. He advised taking the immediate and drastic measure of stripping the monasteries and bishoprics of their wealth, and transferring it to the laity. This, he held, was the surest and quickest method of satisfying the civil authorities and of bringing back the clergy to the practice of the apostles. To reduce this to a working theory, Arnold reportedly formulated the following propositions: "Clerics who own property, bishops who hold regalia [royal land grants], and monks who have possessions cannot possibly be saved. All these things belong to the [temporal] prince, who cannot dispose of them except in favor of laymen." The higher clergy, of course, vehemently rejected Arnold's teachings, but elements in the growing middle class welcomed them. Brescia was thrown into crisis, although the details are not clear, due to the scarcity of documents. Some facts, however, seem certain. First, a journey was made by the local bishop, Manfred, to Rome about 1138. Then, an insurrection arose at Brescia during his absence. Finally, Arnold allegedly attempted to prevent the bishop's exercise of temporal power when he returned. Arnold sought to justify his revolt and appealed to Rome, but was condemned by Innocent II at the Lateran Council, in 1139. The pope commanded Arnold to keep silent and sent him into exile. He was forbidden to return to Brescia without the express permission of the pontiff. The issue of Arnold's teachings also came before the Synod of Sens in 1140. There, Arnold could be found by the side of the famous Abelard, who was about to make his final struggle in defense of his own views. Opposing them both was the equally famous Bernard of Clairvaux, whose intellect matched Abelard's and whose piety out-shone even that of the ascetic Arnold. Accounts written by the victors portray the debate as an utter rout in favor of the conservative Bernard. Both men were condemned to perpetual confinement in separate monasteries, a sentence that was confirmed by Innocent II in his bull dated July 16, 1140. Arnold's writings were also condemned to be burned, as were Abelard's, as a further measure. None of Arnold's writings survive, and his teachings are known only through the reports of his enemies. 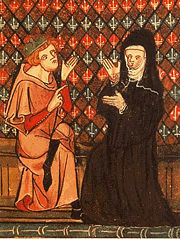 Abelard publicly recanted his views and took refuge with Peter the Venerable, the abbot of Cluny. The younger and more rebellious Arnold was less compliant. He retired temporarily to the Abbey of Sainte-Geneviève in Paris, where he soon opened public courses of moral theology, continuing to preach his radical ideas concerning apostolic poverty. According to John of Salisbury, he attracted disciples mainly from the impoverished people of the city who were so needy that they had to beg their daily bread. This, however, accorded very well with Arnold's teachings, which sharply censured the luxury of bishops and the worldly possessions of monks. Wealth, Arnold insisted, was the real virus that was infecting the Church. Arnold's attacks did not stop here, however. He engaged his harsh diatribes against those who had condemned Abelard and himself. Arnold was particularly harsh in is criticism of Bernard of Clairvaux as a man "puffed up with vainglory, and jealous of all those who have won fame in letters or religion, if they are not of his school." Bernard, on the other hand, denounced Arnold to Louis VII as "the incorrigible schismatic, the sower of discord, the disturber of the peace, the destroyer of unity." Bernard, having succeeded in forcing Arnold out of Italy earlier, took satisfaction in reporting to his readers that, "The most Christian King drove (him) from the kingdom of France." Thus compelled to flee again, Arnold took refuge in Switzerland. The tireless Bernard continued in pursuit of his foe. By 1143, Arnold had left for Bohemia, where he begged protection from a papal legate, Cardinal Guido, who was touched by his misfortunes and treated him with friendliness. This attitude vexed Saint Bernard, although it may be that Arnold had given Guido pledges of submission to the pope's will. Arnold soon returned to Italy to make his peace, in 1145, with Pope Eugene III. The pontiff, on reconciling him with the Church, imposed a form of penance then customary: Fasts, vigils, and pilgrimages to the principal shrines of Rome. Rome itself, however, was now in the throes of its own secularizing reform. When Arnold arrived, he found that the followers of Giordano Pierleoni had asserted the ancient rights of the Roman republic. They took control of the city from papal forces and founded a republic, the Commune of Rome. Arnold, no doubt seeing God's providence at work, sided with the commune and soon rose to its intellectual leadership, calling for liberty and democratic rights. Arnold reportedly went so far as to declare that clergy who owned property had no power to perform the sacraments. The Curia became the chief object of his attacks; he depicted the cardinals as vile hypocrites. He accused Eugenius himself of being more concerned "with pampering his own body and filling his own purse than with imitating the zeal of the Apostles whose place he filled." Arnold especially reproached the pope for relying on physical force, and for "defending with homicide" his own power. His preaching and the support of the commune succeeded in driving Pope Eugene into exile in 1146. From 1146-49, Roman democracy triumphed under Arnold of Brescia. For this, Arnold was excommunicated, on July 15, 1148. However, when Pope Eugene returned to the city later that year, Arnold continued to lead the blossoming republic, despite his excommunication. Meanwhile, Arnold's reform took on an increasingly secularizing character. He demanded not only the abolition of the temporal power of the papacy but also the subordination of the church to the state. Eugenius III used his own powers of persuasion to win a key ally in the Holy Roman Emperor, Frederick Barbarossa. Then, the senatorial elections of November, 1152 turned against Arnold, marking the beginning of his fall. 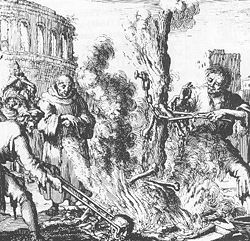 Arnold of Brescia burned at the stake in Rome after being hanged for treason. After Eugene's death, Pope Adrian IV took steps to regain control of Rome. In 1155, he placed the city under papal interdict, and Frederick Barbarossa, at the pope's invitation, took Rome by force. Arnold was seized by imperial forces and was finally tried by the Roman Curia as a rebel, though not for heresy. As a result of his conviction for treason against the papal state, he was hanged and his body burned. At his trial, and even facing his death, Arnold refused to recant any of his positions. As he remained a hero to large sections of the Roman people and the minor clergy, his ashes were cast into the Tiber to prevent his burial place becoming venerated as the shrine of a martyr. "Forger of heresies," "sower of schisms," "enemy of the Catholic Faith," "schismatic," "heretic"—such are the terms used by Arnold's contemporary opponents and other early critics. Others saw him as a pious and holy man, even a prophet. Arnold's direct followers, known as Arnoldists, were eventually condemned in 1184, at the Synod of Verona. Others, such as the Waldensians and Spiritual Franciscans, adopted his teachings on the importance of apostolic poverty, though not always insisting on its application throughout the church. The basic points of Arnold's criticism of wealth in the Catholic Church remained powerful influences in the pre-Reformation period. Martin Luther himself was animated in part by Arnold's spirit. In 1882, after the collapse of papal temporal powers, the city of Brescia erected a monument to its native son. In summing up his life, the sixteenth century Catholic writer, Cardinal Caesar Baronius, called Arnold "the father of political heresies." The Protestant view was expressed by Edward Gibbon, who found that "the trumpet of Roman liberty was first sounded by Arnold." Greenaway, George William. Arnold of Brescia. Cambridge: The University Press, 1931. Lambert, Malcolm. Medieval Heresy: Popular Movements from the Gregorian Reform to the Reformation. Oxford: B. Blackwell, 1992. ISBN 9780631174325. Russell, Jeffrey Burton. Dissent and Reform in the Early Middle Ages. Wipf & Stock Publishers, 2005. ISBN 978-1597520867. Wakefield, Walter L., and Austin P. Evans. Heresies of the High Middle Ages. New York: Columbia University Press, 1991. ISBN 9780231096324. This article incorporates text from the 1917 Catholic Encyclopedia, a work in the public domain. History of "Arnold of Brescia"
This page was last modified on 23 November 2016, at 19:56.